Google Cast for Audio: Can Google's AirPlay Answer Be More Open? The newly announced Google Cast for Audio gives Chromecast-like audio powers to Wi-Fi enabled speakers and soundbars. It basically sounds like Google's version of AirPlay. Does that mean it's going to suffer from AirPlay's unfortunate drawbacks? Playing music or other audio content through a "Cast Ready" speaker will work much like video works using Google Chromecast: Hit the cast button, and like magic, and audio plays. At launch a whole bunch of apps will work with the technology. be compatible with the following apps: Pandora, Google Play Music, Rdio, Deezer, Rhapsody, Napster, TuneIn, NPR One, iHeartRadio, BeyondPod. 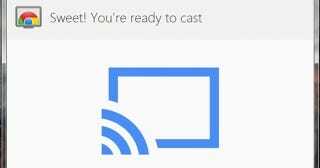 Of course as the name "Cast Ready" implies, Google Cast for Audio is a closed platform that will be available on products only from partners. For starters: LG, Denon, and Sony. When it launches in the spring, those companies will have products enabled with the new technology. At its CES press conference this morning, LG announced that its new Music Flow speakers would support Google Cast. It appears only new products will work with the technology. According to Sony, at least, there are no plans to add computability to older products through firmware updates. This despite the fact that Google tells us Cast for Audio is compatible with existing S0Cs that are already out there. At the very least, Google has strong chip-side partners like Broadcom so that when a manufacturer decides it wants to play ball with Cast for Audio, implementing it should be as easy as buying a chip off the shelf. Additionally, for the time being, Google says there are no plans to create a Chromecast like dongle that will equip products with USB or HDMI connections with Cast for Audio powers. If we learned anything from Apple AirPlay—and there should've been lots of lessons—it's that buying a whole new speaker to get access to wireless playback technology was a little excessive for most people. The genius of Google Chromecast is that the barrier to entry was a $35 dongle. Will people be willing to pay extra or upgrade there setup just to get Google Cast for Audio? Probably not. That said, it might be a nice selling point for people who are in the market for new gear. I'm looking forward to seeing how Google builds out the platform so that it's expansive, instead of just being another walled garden.